Hope you all enjoyed Super Bowl Sunday! 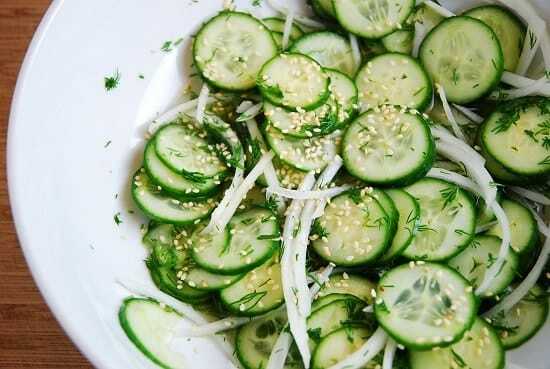 But if you are like me, and may have went a little overboard with all the game day goodies, then my take on a Japanese Cucumber Salad Recipe is the perfect cool and crisp side salad to add to your meal today. It’s so light and refreshing, and at just 1 Point, it’s a great way to bulk up a meal without using a lot of your Weight Watchers Points. It’s a great flavor combination of sweet and sour, and the toasted sesame seeds add a nice, delicate nutty flavor. Bonus – the cucumbers have an anti-inflammatory effect and are very hydrating, so it’s a great way to combat all the sodium from the salty foods you may have indulged in. This Japanese Cucumber Salad also makes a great side to a many meals (not just sushi!). I love it with a spicy fish or chicken dish. Definitely one of my favorite low Points Weight Watchers salads recipes. Enjoy! An easy and delicious side salad recipe for your favorite meal, this is light and refreshing. It’s a great combination of sweet and sour with a delicate nutty flavor from the sesame seeds. Place cucumbers, dill and onions in a medium sized bowl. In a small bowl, whisk together the vinegar and sugar until sugar is fully dissolved. Pour vinegar over cucumbers and onions, toss well. Top with toasted sesame seeds.